Barney Rubble: Barney was the loveable sidekick and neighbor to Fred Flintstone. Barney, though somewhat dim-witted, always supported Fred’s schemes. Barney’s interests are described to include bowling, playing pool, poker, tinkering around in Fred’s garage and playing golf. He was also a member of the Loyal Order of Water Buffalos lodge and the Loyal Order of Dinosaurs. He is also a talented pianist and drummer. Barney married the super hot Betty and they later adopted Bamm-Bamm. Barney has an obvious fondness for food. It was never quite clear what Barney’s occupation is or what, if any skills he possesses. 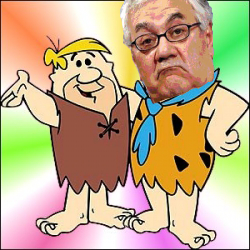 Barney Frank: This Barney was a lovable partner to Steven, a male prostitute, who used Frank’s apartment to run a male prostitution ring “without Frank’s knowledge.” Barney’s interests are bullying banks, wrecking economies, and blaming others for the carnage. Barney is now the Chairman of the House Financial Services Committee showing that if you wait long enough in government, you will achieve a level of control where you can really wreak havoc. These are the same programs that lead to the collapse of the subprime mortgage market, wiped trillions dollars from our economy, and produced the world-wide economic crisis. Ignoring all the warning signs, Barney Frank, whose committee oversees Fannie Mae and Freddie Mac, kept resisting reforms and besmirching those voicing concerns. What one does for love. And this is not fiction…Barney Frank recently claimed that unless Fanny Mae and Freddie Mac (your government owned mortgage guarantee corporations) RELAXED lending standards our economic recovery could be threatened. 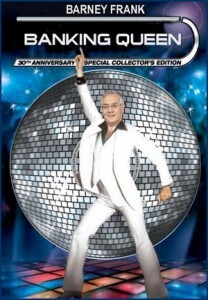 Maybe the good citizens of Massachusetts could do the rest of the country a favor and send Barney Frank packing? This article was published on Jul 31, 2009 . It is tagged barney frank, barney rubble, barney squared, collapse, fannie mae, freddie mac, prostitution ring, Separated At Birth, subprime mortgage. You can follow any responses to this article through the comment RSS feed.